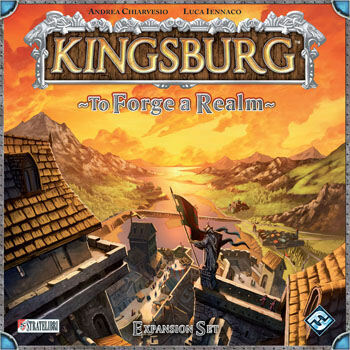 As the territories of Kingsburg expand, the forging of the realm continues! A host of new governors have been given command of outlying provinces of the royal realm, and once again they must influence advisors, strengthen their provinces, and defend the realm from the depredations of marauding foes. Competing with their fellows, governors must utilize brand new abilities and buildings to their fullest to secure a place on the kingâ€™s council! Other products in the "Kingsburg" series. Kingsburg's expansion does exactly what a great expansion should do: add more elements and depth to an already good game without changing the feel of it too much. What's great is that you can mix and match the new and old rules to make each game different. A great game just got better! Enjoy! This expansion comes with the piece's that match the original game and allow that extra level of randomness in the game. The rules and new game play are simple and concise. I am very happy with this addition and would recommend adding this game to your collection. If you like Kingsburg, this expansion adds a lot of variability and strategy to the already great game! This is to Pandemic what On the Bring was! Five ways to tweak and improve the game - you can't go wrong. It all fits in the original box, too!